As retractable screens become more popular among homeowners, Ambit Energy wants to help you weigh the pros and cons of these innovative screens before you decide to install them. Retractable screens are convenient and you only see them when you need them. They can remain out of sight when not in use and they are versatile, which is one of the main reasons why they’re appealing to homeowners. Retractable screens can be installed in various places around your home, including doors, covered patios and porches, windows, garages and more. The screens are hidden from view, so they’re only visible when you need them. There are even companies that offer motorized retractable screens that slide back into casing hidden within walls, columns and archways. Additionally, the screens can help reduce the amount of energy used to cool down your house, lowering your air conditioning costs. To help you understand more about retractable screens, Ambit Energy provides you with a few pros and cons. Protection from the sun and UV rays – Retractable screens can serve as a shade from the sun and help to minimize the sun’s glare. Additionally, with certain motorized retractable screens, you can use a specific kind of screen mesh such as solar shades that minimizes the sun’s glare, which lowers energy consumption and air conditioning costs. Protection from pesky bugs – If you install retractable screens on your covered patio, you can enjoy the view of your backyard even during the summer months without the worry of unwanted bugs and mosquitoes. The screen essentially serves a barrier to protect you from insects outside. Lower energy bills – You can use the retractable screens to lower your energy costs. You can let cool air circulate in your home at night or during the day if there is a nice breeze during the spring or summer. For instance, if you have retractable screen doors, you can cool your home naturally by opening the doors to let the air come in through the screen. They also can be used as a natural heating solution for indoor climate control during the winter months. Unobstructed views – If you have a solid door that blocks the view of your backyard, then you can’t enjoy the scenery. By installing a retractable screen, you can enjoy the view and extend your outdoor living space. High Costs – Retractable screens are more expensive than fixed screens. The typical expense for a motorized retractable screen system is several thousand dollars for a screen porch, for example. Potential issue for pets – It’s important to keep in mind that retractable screens on doors don’t serve the purpose of preventing animals from entering or leaving the house. It is also possible depending on the type and quality of the retractable screen for a pet to push its way underneath the screen if it’s not secured properly at the top or bottom. Several moving parts – The screens have several moving parts, which means there will be several things to adjust if they stop functioning properly. For instance, if you have a retractable screen door that stops working, then it may be more challenging to determine the cause and you may have to take the door apart. Tripping hazard – Depending on the installation, the track that the retractable screen uses in a doorway can pose a safety hazard. 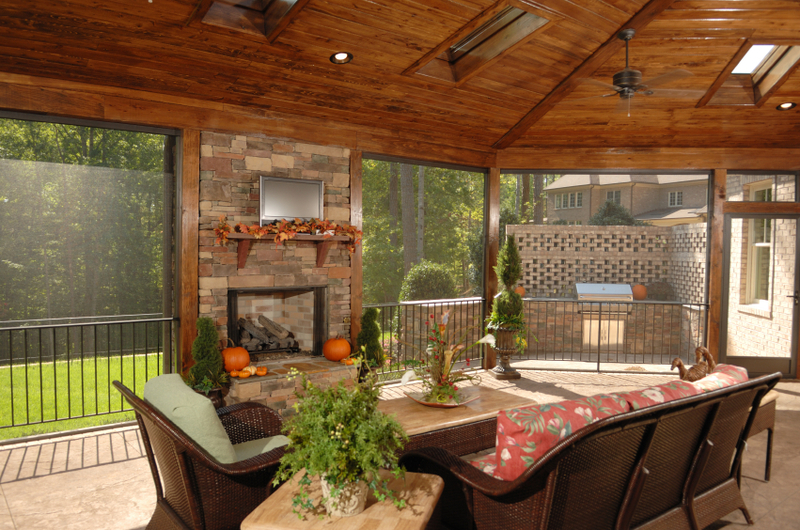 There are several advantages and disadvantages to adding retractable screens to your home. Ambit Energy hopes these pros and cons can help you decide whether or not you want to make the investment in your home by adding retractable screens.